Hadrian’s Wall has long attracted hikers and history fans and is now the heart of an 84-mile-long (135 km) National Trail through some of Britain’s most beautiful countryside. Hadrian’s Wall stretches coast to coast across northern England, from Wallsend in the east to Bowness-on-Solway on the west coast. Three years ago, I set out to explore Hadrian’s Wall, following in Hadrian’s footsteps and of the Roman soldiers who once patrolled the empire’s frontier. Hadrian’s Wall consists not only of the visible remains of the Wall itself, but also of its associated forts, milecastles, turrets and earthworks. The sites of several Roman forts lie along the route including Segedunum at Wallsend, Chesters, Housesteads, Vindolanda and Birdoswald. Naturally, I visited all of them and I will certainly report on them in the future. My walk began near the Roman Army Museum, close to Carvoran’s fort. After visiting this great museum -which gives you a rare insight into the daily life of a Roman soldier- I started to walk east along Hadrian’s Wall Path, all the way to Vercovicium (Housesteads, the best preserved Roman fort in Britain). This section covers a distance of around nine miles (15.5 km) and offers the most exciting walk of the entire Wall. It can be sometimes strenuous, but the views are magnificent and there are a number of well-preserved milecastles and turrets along the way. This article contains a selection of my best photos, covering the Wall section from milecastle 42 to milecastle 37 (walking west to east). Hadrian’s Wall, Milecastle 42 (Cawfields). Milecastle 42 is believed to have been built by the Second Legion. Each milecastle on Hadrian’s Wall had two associated turret structures. A fragment of a tombstone and a Hadrianic building inscription were found there. Carrying on, the path descends into Caw Gap reaching the remains of Turret 41a. These turrets were positioned approximately one-third and two-thirds of a Roman mile to the west of the Milecastle, and would probably have been manned by men from the milecastle’s garrison. Hadrian’s Wall, Turret 41A (Caw Gap). Continuing walking east, the Wall runs on past Thorny Doors (where it stands 13 courses high) and Winshields Wall, the highest point along Hadrian’s Wall. Hadrian’s Wall, walking east to Milecastle 39. Hadrian’s Wall, walking east to Milecastle. Hadrian’s Wall, walking east along Peel Crags to Milecastle. Hadrian’s Wall, heading to Milecastle 39 and first glimpse of Highshield Crags and Crag Lough. The path now reaches Milecastle 39 (Castle Nick). It was probably built by the Sixth Legion. Inside are the remains of barracks and other buildings. The milecastle is now consolidated and the walls are up to 1.75 metres high. Hadrian’s Wall, the remains of Milecastle 39, near Steel Rigg. The path then has one of its steeper descents to reach Sycamore Gap. It is one of the most iconic and best Hadrian’s Wall views, and a much photographed point. The tree famously featured in the film Robin Hood, Prince of Thieve (1991). This is a particularly enjoyable section with great views all the way back to Peel Crags and Windshield Crags. Hadrian’s Wall, heading up to Highshield crags looking back to Sycamore Gap, Peel Crags and Windshield Crags in the distance. Continuing walking east, the view ahead is dominated by Highshield Crags and Crag Lough. Crag Lough is an inland lake located at the foot of the crags. Hadrian’s Wall, Highshield Crags and Crag Lough, an inland lake along Hadrian’s Wall, at the foot of a line of crags. The next section of path crosses Hotbank Crags and milecastle 38. Little remains of this milecastle. However, it is notable for the joint inscription bearing the names of Hadrian and his close friend Aulus Platorius Nepos, governor of Brittania at the time the Wall was built. The milecasle 38 inscription proves that Hadrian commissioned the wall that now bears his name (you should watch this video which shows the inscription and explains its importance). It is on display at the Great North Museum in Newcastle. Hadrian’s Wall, Hotbank Crags, heading towards Milecastle 37 and Housesteads Roman Fort. The path continues to Housesteads milecastle (37). It is perhaps the most visited milecastle due to its location, close to Housesteads Roman fort. Inscriptions found here shows that it was built by the Second Legion. Hadrian’s Wall, heading towards milecastle 37. Hadrian’s Wall, North gate arch of Milecastle. The path then reaches Housesteads (Vercovicium), the best-known fort and my favorite place on Hadrian’s Wall. But this will be the subject of a future post. Barracks, Housesteads Roman Fort (Vercovicium). Hadrian’s wall trail is an extraordinary journey which gives you a unique insight into a fascinating era in history as well as a massive respect for the soldiers who engineered and built the Wall. Hello Carole. Thanks for these wonderful photo’s of Hadrian’s Wall. I love this place and have walked some of it but not all. As you say the scenery is spectacular. I especially like Houseteads also Vindolanda. Thanks for sharing your journey. I love it! I hope one day before I meet my end, to walk the entirety (or most of it) of the wall. 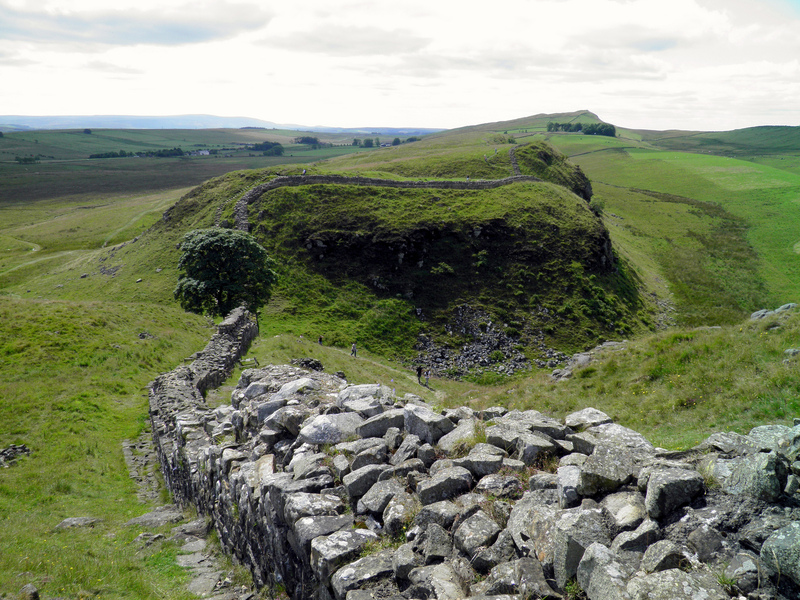 Pingback: Edible Architecture: Hadrian’s Wall | Latin Alive!